Welcome to GoldPay, the best credit card processing for GoldMine! How it works. When you click the GoldPay button in GoldMine, GoldPay opens a form containing the contact's name and address, along with the option to use an alternate name from the Additional Contacts tab. You'll type in the sale amount, credit card number, expiration date, CCV code, and hit the Submit button. (Any previously saved cards will also be available on a dropdown list.) In a few seconds you'll get the reply indicating success or failure. GoldPay logs successful transactions to History. GoldPay does not store any credit card numbers in your GoldMine, but does permit you to save card nicknames using a reference "token" to be used for future sales to the same client. GoldPay handles partial and total refunds with ease. GoldPay permits two-part processing, i.e. authorization followed by subsequent "capture," or completion. Installation and setup take only a few minutes, and are quite simple. Processing. 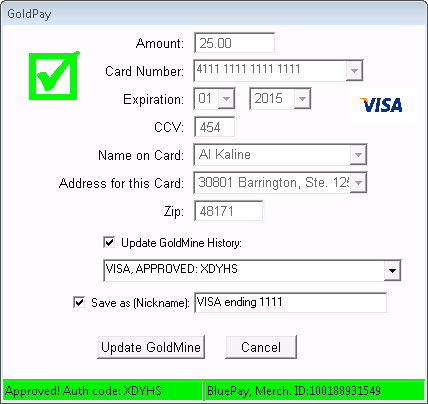 Presently, GoldPay works only with BluePay Processing, Inc., and Avid Payment Solutions. Call Dylan at BluePay, and ask him for a "Sandbox Account" for use with GoldPay; tell him Steven sent you. Dylan will want to give you a quote showing you how much money you'll save by switching your processing to BluePay. Don't worry, he's harmless. Let him give you a quote; he'll probably be able to save you some money. You can call Dylan in Chicago at (630)300-2363 or send him an email at ddegrave@bluepay.com. No, he's not related to Bob Dylan. Or... call Clint at Avid. Clint's number is (248)723-5760, ext. 101. Let him know you're working with Plain English, and you need a trial account with FirstData. In particular you need a Gateway ID and Password, optionally, a Merchant ID. Clint, also, will show you how he can save you money over your current processor. In either case, if you're simply not ready for a quote, yet, on processing, just let them know that, as well, and they'll still get you hooked up with the demo codes you'll need for running a trial. Buy it now. It's a no-brainer. Taking money from your clients has never been so simple. Think about the momentum your salesreps have when talking up a client on the phone... why slow down to shift in to another system (or worse, transfer them to another person!) just to take their payment? It only slows things down, and gives them a chance to change their mind. Check out our top 10 list for nine more reasons to buy GoldPay. Our ever evolving product documentation can be found at www.plain-english.com/goldpaydoc. We'll also have a special forum section dedicated to the GoldPay for comments, questions, complaints, etc. This next bit is completely optional, but... you'll make us incredibly happy if you would please take another 10 seconds to let us know what got you here. How'd you hear about Plain English and product(s)? Please click the Submit button now to complete your registration.